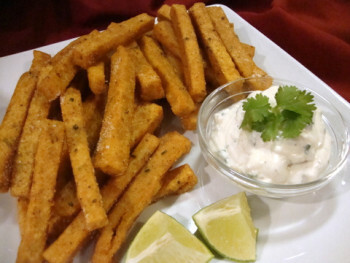 Golden brown and crispy on the outside and tender and delicious on the inside, these savory and generously spiced polenta fries are served with a tangy, citrusy sauce for dipping. Lightly oil a 9×5-inch loaf pan; set aside. In a medium saucepan, bring the water, butter or margarine and salt to a boil. In large measuring cup, mix together the cornmeal and remaining ingredients. When the water comes to a boil, reduce the heat to medium-low. While vigorously whisking, SLOWLY pour the cornmeal mixture into the simmering water. Slow addition of the cornmeal with vigorous stirring ensures that the corn meal does not form solid lumps. If lumps form, keep whisking until they break apart. Cook, stirring frequently, until the mixture is thick and begins to pull away from sides of saucepan. The mixture will cook quickly. Spoon the cornmeal mixture into the loaf pan and smooth the top with the back of a spoon or rubber spatula. Let the mixture cool for about 15 minutes and then place plastic wrap directly in contact with the surface; refrigerate for 6 to 8 hours or until firm. In the meantime, prepare the aioli by mixing together the ingredients in a small bowl. Cover and refrigerate until ready to serve. Once the polenta has chilled and firmed, turn the cake onto a work surface. Cut the cake in half and then cut each half into “fries” or wedges (or any shape you desire). Deep fry the polenta in hot oil until golden brown and crispy. The polenta will take longer to brown than potato fries. Drain on a plate lined with several paper towels. Serve hot with the aioli. 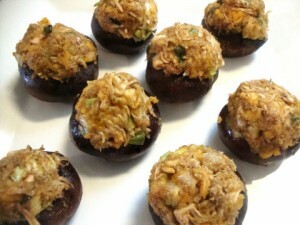 Large mushrooms are filled with a zesty mock crab filling, green onions and shredded cheese and baked to perfection. These mushrooms make a wonderful first course or light entrée. Notes: For this recipe, you will need 1 can (about 17. oz.) of green jackfruit. Canned green jackfruit has no real flavor of its own, but has an uncanny resemblance to shredded crab when cooked. It can be found in Indian and Asian markets or purchased through the internet. Look for the label “Green Jackfruit” or “Young Green Jackfruit” and be sure that it’s packed in water or brine (preferably water) and not syrup. You may notice cans of ripe jackfruit packed in syrup stocked nearby but don’t be tempted to substitute as it will be too sweet. If you cannot locate jackfruit, try substituting with 1 can of hearts of palm. Canned hearts of palm can be found in most supermarkets. While not exactly the same texture as jackfruit, they will flake nicely in a food processor and will serve the purpose for this recipe. Hearts of palm have a tangier, acidic flavor, whereas jackfruit is more neutral. Please note that hearts of palm is commercially grown and harvested in Central America and Hawaii and has absolutely no relation to the palm species from which palm oil is derived. Drain the liquid from the can of jackfruit or hearts of palm and rinse thoroughly. Drain in a colander. If using jackfruit, remove the tough core from each chunk of jackfruit with a sharp knife and discard. Break the chunks apart with your fingers and remove the soft seeds and discard. If using hearts of palm, simply slice the hearts about ¼-inch thick. Wrap the jackfruit or hearts of palm in a lint-free kitchen towel or several layers of cheesecloth and squeeze to remove as much water as possible. Place the jackfruit or hearts of palm in a food processor and pulse a few times to flake. Do not purée! You will need about 1 packed cup for this recipe; a little more or less is fine as the measurement doesn’t need to be exact (if you have extra hearts of palm, try adding the flakes to salads, since hearts of palm do not need to be cooked to be consumed). Set aside the flakes in a mixing bowl. Add the vegetable oil to a skillet and place over medium heat. Add the green onions and sauté for 1 minute. Add the flaked jackfruit or hearts of palm and sauté an additional 2 minutes. Stir in the Old Bay™ or Chesapeake Bay™ seasoning and the kelp powder and return to the mixing bowl. Add the breadcrumbs, mayo and shredded cheese and stir thoroughly until combined. Pack the mushrooms with the mock crab mixture. Lightly spray a baking sheet with vegetable oil and place the mushrooms on the baking sheet. Bake for 20 minutes. Serve immediately. 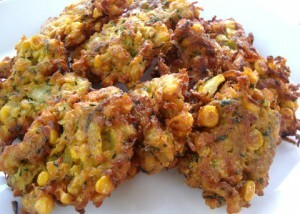 Shredded zucchini, sliced onion and corn kernels are seasoned with curry and fried until crisp and golden brown. This recipe yields about 1 dozen fritters. Shred the zucchini with a standard vegetable grater or using the shredding blade on a food processor. Transfer the shreds to a large mixing bowl, add 1 teaspoon salt, stir well and set aside for 15 minutes. The salt will help draw out the moisture from the zucchini. Pour off any excess liquid and place the shreds in a clean, lint-free kitchen towel or several layers of cheesecloth. Gather up the edges at the top and twist securely closed. Twist and squeeze the bundle into the sink to remove as much liquid as possible. Transfer the shreds back to the mixing bowl and set aside. Add the well-drained corn kernels to a food processor fitted with a standard chopping blade and pulse the contents 4 times. The goal is to break up the majority of the corn, releasing the starch while still leaving some kernels intact. DO NOT over-process! Transfer the corn to the mixing bowl. Add the onions, ½ cup garbanzo bean flour, curry, ¾ tsp salt and the black pepper. Stir thoroughly until a thick batter is created. If the mixture seems too loose, add 2 tablespoons additional flour. Set the mixture aside. In a wok or deep skillet, heat ½-inch oil over medium-high heat. When the oil begins to shimmer, test the batter by carefully placing 1 heaping tablespoon of the batter carefully into the hot oil. After 1 minute, gently press down on the fritter with the back of a spoon to flatten it. Continue to fry for a few minutes unto golden brown on both sides. Use 2 large spoons to help turn the fritter; this will prevent splashing of the hot oil. If the fritter holds together, repeat the process, working in batches to avoid overcrowding the skillet. If the fritter falls apart, use a slotted spoon to remove it from the oil and add a little bit more flour to the mixture to help it hold together. Transfer the fritters to a plate lined with paper towels to absorb any excess oil. If necessary, reheat the fritters in a 350°F oven until hot. Serve immediately. 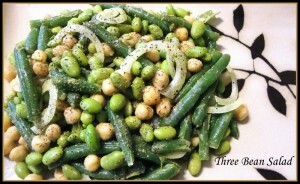 Fresh cooked green beans, mukimame (shelled edamame aka green soybeans), chickpeas and sliced onion are tossed with a light and refreshing cumin-scented vinaigrette. Steam the green beans until crisp tender. Rinse with cold water to stop the cooking process and drain. Cook the mukimame according to the package directions; rinse with cold water and drain. Add the green beans and the mukimame to a large mixing bowl. Add the thoroughly rinsed chickpeas and the sliced onion. Set aside. In a small skillet, toast the cumin seeds over medium heat until fragrant. Place the cumin seeds in a blender with the remaining ingredients except for the black pepper and process until smooth. Pour over the beans and gently toss to avoid breaking the green beans. Add the black pepper, to taste, and gently toss again. Chill for a minimum of 30 minutes to blend the flavors before serving. 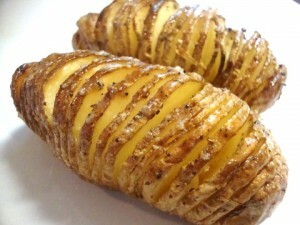 Named after the Stockholm restaurant that first introduced them, Hasselback potatoes have been adopted widely by other European cuisines. Place 2 chopsticks on your cutting surface parallel to each other and place a potato in between them. The chopsticks will be used as a cutting guide to prevent the knife from cutting all the way through the potatoes when slicing. If you don’t have chopsticks on hand, use the handle side of 2 table knives. Using a sharp chef’s knife, begin making ⅛-inch slices throughout the entire length of each potato. In a small saucepan, melt the butter over low heat; alternately this can be done in the microwave. Place the potatoes on a baking sheet lined with parchment paper, and with a pastry brush, brush the melted butter into the gaps of every potato. Use your fingers to gently separate the layers if necessary. 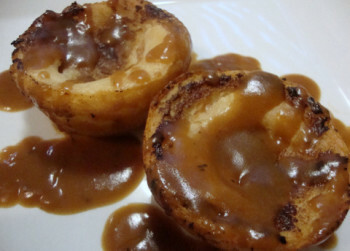 Make sure that every potato gets a generous amount of the melted butter. Generously season the potatoes with salt and pepper to taste. If using the optional garlic, insert the garlic slices randomly between the potato slices. Place the potatoes in the preheated oven on a middle rack and cook for 1 hour and 15 minutes until crispy on the outside and tender on the inside. Garnish with fresh chopped Italian parsley or minced chives if desired.